The AquaPodKit is easy to install and provides the safe water your family will need in the event of a contaminated public water supply. Storm surges and destruction from hurricanes, water main breaks and other catastrophes can make tap water unsafe to drink. 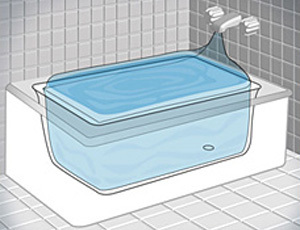 With up to 65 gallons and a convenient pump, theAquaPodKit can provide a 14 day supply of water for basic needs for a family of four, and at a much lower cost than bottled water. When the next hurricane threatens, don’t be without the security of a simple solution for fresh water. Don’t drive to the market only to find yourself too late even to get bottled water. Buy one or more today for every residence. Share them with family and friends you care about. 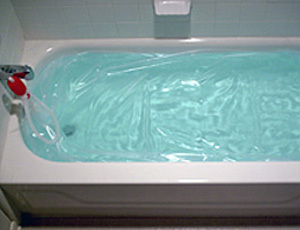 With only enough notice to fill theAquaPodKit, you can rest assured of having the supply you’ll need. Please visit our showroom to see for yourself this quick and simple method for securing your family’s drinking water supply.